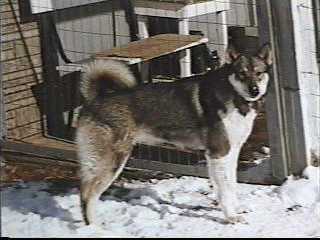 The West Siberian Laika originated from aboriginal dogs of Mansi, Hanty and Zyryan people sampled in Ural and West Siberia, as far to the east as the Ob River Basin. Primitive dogs of similar type were also found in some places of central and East Siberia and used for breeding with registration. 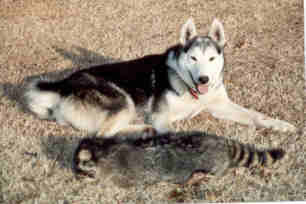 The West Siberian Laika is related to other Spitz-like breeds used for hunting in northern Europe and Siberia. Since prehistoric times, Laikas helped hunters to obtain fur for money and clothes and meat for food. In some areas the same dogs were used for both pulling sleds and hunting. In XII-XIII Centuries, native peoples of Siberia and Russians, paid their tribute to Mongols (Yassak), a considerable part of which was valuable fur of sable and other animals. Under rule of Ivan the Terrible, in XV Century, Russians advanced eastward. According to old accounts, at that time, one good pelt of sable could bring enough money to buy a 50-acre farm. The first Russian seaport to begin their trade with England was Archangelsk and the sole trade commodity was fur, most of which was obtained with Spitz-like hunting dogs of northeastern Europe and West Siberia.